An arbitrator has awarded Jacob Trouba a salary of $5.5 million for the 2018-19 season. Winnipeg has 48 hours to accept the ruling or turn it down and make Trouba an unrestricted free agent. Trouba, 24, was one of five restricted free agents on the Jets to file for arbitration earlier this month, including Connor Hellebuyck, Adam Lowry, Brandon Tanev and Marko Dano. Two years ago, Trouba had asked for a trade. He sat out the first 15 games of the 2016-17 season before inking a two-year bridge deal for $2.5 million US that year and $3.5 million US in 2017-18. The six-foot-three, 202-pound defenceman went on to score a career-high 33 points in 60 games during 2016-17. But last season, plagued by injury, he was held to 24 points. One of the reasons Trouba sat out was because he wanted to play on his natural right side. He got his wish when Tyler Myers was injured after his return, and has been in that spot since. He clocked an average of just under 22 minutes per game this season on the top pair with Josh Morrissey. Standing 6-foot-3 and 202 pounds, Trouba was the Jets' ninth overall draft pick in 2012. In May, he indicated he wanted a deal done sooner rather than later. 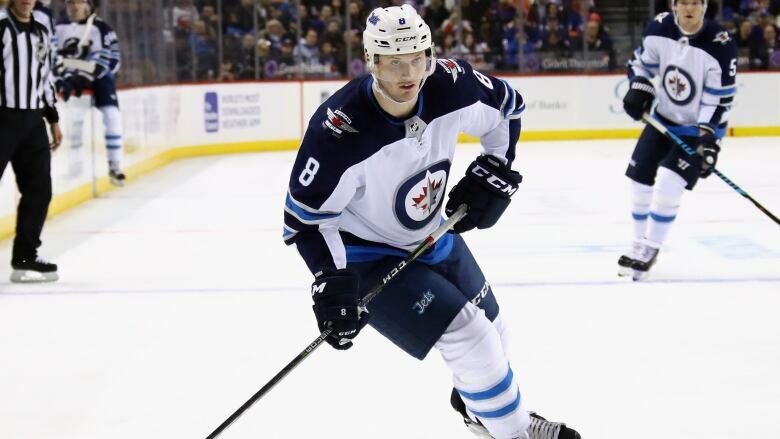 "I get the sense there's a little unfinished business here, with this team," Trouba said in May, after netting two goals and an assist as the Jets made franchise history in the playoffs. "We all have such good relationships on this team. It's fun to be a part of. It's a special team. You want to play for a contender, and that's what we have here." Earlier this month, the Jets locked down playoff starHellebuyck to a six-year, $37-million contract. They also avoided arbitration with Lowry, signing him to a three-year, $8.75 million US contract on Thursday. Arbitration hearings for Brandon Tanev and Marko Dano are scheduled before the end of July.